The league which commenced on July 26, concluded at Casuals Corner, Queen’s Park Savannah, Port-of-Spain, on August 23. The young footballers were awarded with trophies, medals and cash prizes in their respective age categories. Motivational Speaker and Managing Director of In Full Flight, Don La Foucade, who delivered the feature address, encouraged the young footballers to believe in themselves while setting goals for the future. “Once you play from your heart you can travel the earth,” he shared. Delivering remarks on the Bank’s behalf, General Manager, Internal Audit, Anthony Subero, congratulated the footballers on their eagerness and determination to succeed. “Today as you accept your trophies and medals, while you should rightfully be proud of winning, you should also be proud of yourselves for the level of perseverance and team work that you would have displayed throughout the league. Your success in life will only be as real as the effort you put into it,” he said. He added that the Bank created the league, in an attempt to provide to young and aspiring athletes, an avenue through which they could pursue their passion for the game of football. In the Under 10 category, Trendsetter Hawks Football Academy placed first, while Cap Off Youth and SKHY Football Club placed second and third respectively. 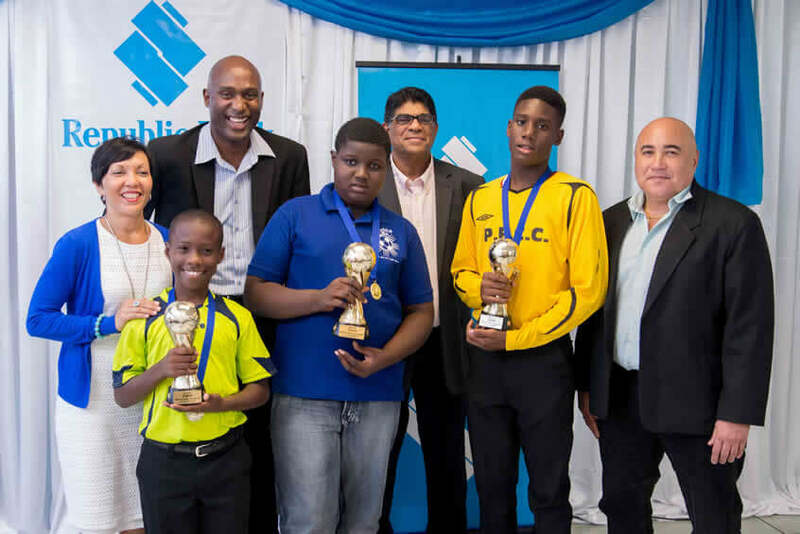 In the Under 12 category, Blast Youth Academy placed first, with Trendsetter Hawks and San Juan Jabloteh placing second and third respectively. Point Fortin Civic Centre placed first in the Under 14 category, while San Juan Jabloteh and Marabella Family Crisis Centre, placed second and third respectively. The Most Valuable Players in the three categories were; Jahiem Marshall ( Under 10 – Trendsetter Hawks Football Academy) Jerry Morris ( Under 12- Blast Youth Academy) and Jaccee Jeffrey ( Under 14- Point Fortin Civic Centre). This year marks the second year the League has been hosted. The League is aimed at preparing young footballers for the next step towards achieving their dreams. Though the name and format of this initiative have changed from those of the Tournament, the focus remains the same- toward youth development through sport. Also speaking at the prize-giving was Managing Director, All Sports Promotion Limited, Anthony Harford. Entertainment was provided by Two Cent Movement duo Akile Wallace and Crystal Mendez. The Bank takes this opportunity to thank all the teams who participated in the League and wish them success in their football endeavours.